In the TLC research, we found that each encounter or meeting between a child or young person and their social worker is unique. It is influenced and shaped by a multitude of factors – like the child’s age, whether they have a disability and how this affects their communication, the relationship between the child and the social worker (have they just met or have they known each other for some time? ), whether the meeting is planned or unplanned and where the meeting takes place. The breadth, nature and the complexity of the issues that social workers and children communicate about, as well as the wider family dynamics are also influential to each encounter. 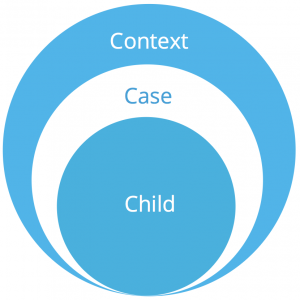 The Child-Case-Context model enables you to make explicit the complexity of the communicative encounters that take place with children. It can help you to articulate what and how factors might affect communication with individual children – both positively and negatively. It encourages you to reflect on these and how you might develop your practice with children. 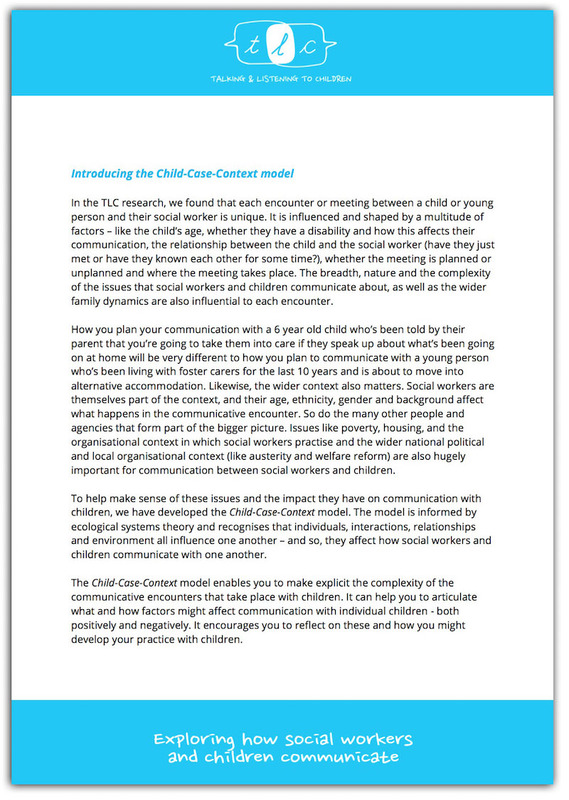 Click the image to download the background paper to the Child Case Context model.